Pawel Georg Karlowicz von Rennenkampf (17th April 1854 – 1st April 1918 ), general cavalry, general – adiutant, colonel. He was born in the castle Pankul nearest local Rewl. Rennenkampf’s ancestors went to region Prussia from Westfalia in XVI century. He started career in army in 1870 year, he was non – commissioned officer in 89th regiment infantry. Education scored in Helsingoforskiej High School Infantry. First rank officer he was promoted in 1873 year in 5th Lithuanian regiment infantry. In 1882 year this first student in school finished Nikolajewska Academy The General Staff. After finishing school he worked in staff in Warszawski Will Army. Since 24th November 1882 until 25th September 1884 year he worked this higher officer for exacted instructions regarding in th Staff XVI Corpus. 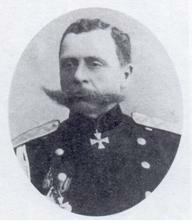 In years 1884 –1886 commanded fleet 42 Mitawskiego regiment dragons name. Prince Prussian Alberta. Since 25th September 1886 year remained in directly instruction The Chief Staff in Warszawski Will Army, while since 2nd November 1886 year worked in this same rank in the Staff Kazanski Will Army. 13th 1888 year worked in rank older adiutant Armies Donskie. Since 31st October 1889 he was officer staff for exacted instructions regarding in the staff II Corpus, while since 26th March 1890 year chief staff Bastion Ossowiec. In years 1891 – 1899 year worked how chief staffs at different divisions cavalry. Since 25th November 1889 year chief staff armies Zabajkalski Will Army. In the rank general – major fought in China campany 1900 year for fight, he gave medal saint George 4th gradute. In years war Russian – Japanese 1904 – 1905 commanded self – reliant unit, where he was outstanding valour. Since August 1905 year he was in Further East under directly commanding main commander. Since 9th november 1905 year commanded VII Corpusem. In 1904 year he promoted to rank general – lieutenant for armies making, while in two years later he was given golden sable ornament diamonds. He was traveling specially train he participated in suppressing revolution 1905 year, which took off in route train. In years 1906 – 1910 he commanded III Corpusem. 6th December 1910 year he was promoted to rank general – infantry. Since 20th January 1913 year he commanding armies Wilenski Will Army. At the moment tooking off war in the base armies at Wilenski Will Army was formed 1. Army, which since 19th July 1914 year commanded. 14 August 1. Army started moving their powers to direct border, which went off three days later. 20th August reached to victim for Russian clash under local Goldap and Gabin, which they could not good used. They could not ask commander advise in this situation and not giving help 2. Army took defeat Russian Armies in Mazurian District lakes. Commander front know that Rennenkampf did not take coordination activing both armies he decided on march to direct local Kaliningrad, caming out from 2.Army.When he saw that Russian Commanding made mistake, German all power took action against general Samsonow. In days since 26 till 31st August German army achieved over victim in the battle fighting at east from Stebark, when it winged and all destroyed 2. Army. They had information about battle, general Rennenkampf did not help 2. Army and he came back behind river Niemen. Defeat Russian Army caused suicide gen. Samsonow, while few thousand Russian soldiers was prisoners of war. Week later, between 5th and 15th September German took off 1. Army gen. Rennenkampf during battle near Mazurian District lakes. Her latest soldiers came back behind river Niemen gaving battle of fight enemy. In battles Russian lost almost 200 thousands soldiers, this was defeat without precedens in history battles fighting for Imperium. At first October near local Mlawa on the new was formed 1. Army, which went in Front Northern -–Western fought in „Operation Lodish”. At this moment her starting until to cutting away from 2 and 5.Armies this on her was all impet tooking up German. Rennenkampf tried formed uniform front and he could not it 1. Army until finishing battles near Lodz and caming back Russian Armies on the new positions took independently battle trying to take to recover region, which was occupied for enemy. General Ruzskij called gen. Rennenkampf for defeats under Lodz, had it place 18th November at made function. At the same time gen. Rennenkampf was under directly commanding Minister War. Specially commission examinated his commanding during battles in Eastern Prussia . 6th October 1915 year he was dissmisal from army but he could have uniform and salary. After revolution February Rennenkampf was arrested and he was prisoner of bastion Pietropawlowska, which was under directly Special Investigating Comission Law War, which had not proves guilt. After Revolution October he was free and went to town Tangarog. When to town came in bolszewic had nickname, but was recognized and in night at 15th to 16th march he was arressted for CzK. He did not go to side enemy he was shot. This commanding gave commander W.A. Antonow- Owsijenka 1st April. Studied according book A.A. Zalljesskij, First War World, Moskwa 2000.